Just returned from Arizona and Hopiland. 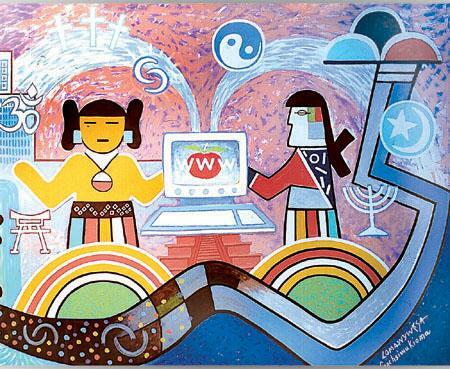 I found I have work to do there and intend to create my second book, The Sacred Hearts of Hopi, These people have spiritual knowledge of such depth and heart, yet so simple and pure. Hopi means peace. I lived at Second Mesa Day School, a Bureau of Indian Affairs K-8 school as the school counselor, assist. principal and truant officer. Of course, the most interesting experience was going up top to find out why someone hadn't made it to school. Often times, they were assisting in the dance coming up at their particular village. Their elder always made it clear to me, even if they only spoke their native tongue, that the ceremony was more important than going to school that day. I must say, it seemed true to me as well. I had many strong prophetic dreams, visions and enlightenening experiences there that I have written about and will include in the beginning of the book. I was pregnant with my son when I lived there until he was four and his Hopi nanny, Cita and her family are who we visited and stayed with the past two days. Felt like I was coming home. The sky is so high and amazing, thunderclouds, kachina hairs streaming down as the rain poured in areas you could see all around for miles. We stopped and I picked some mormon tea for blood purification. I had a tooth infection and remembered how potent this tea was. Also collected some cedar for smudging sticks. The sage wasn't ready. Several invitations to return. One, was a woman that worked at the school when I did. Virginia. Haven't seen her for ten years and she welcomed me as a sister, daughter and lifelong friend. We embraced and cried in each other's arms. Cita, Ocean's nanny too cried in my arms. Her son is recovering from alcohol dependency and lives in Phoenix, participating in Pow Wow Drum Circles. Powerful way to release rage through wailing. Virginia, who was a daughter of one of the village medicine men,( they call them to the public bone adjustors).We talked for an hour and felt a strong urge to return on a regular basis for giving healing work with these sacred, precious people that are holding a space in the heart of Arizona like no other I have ever known. She immediately said yes, please come. I am meeting with three women and we are supporting each other through these tough times. She is retired, a couple of years older than I and has her grandchildren and a few other's children she cares for as a day care. Her youngest grandson was still eating when I arrived. He was a bit fussy and his mother went into the other room without a word. Virginia shared with me that his father, her youngest son, was drinking again. He is an amputee.....well the year old boy went into another room and came back with a traditional gourd rattle and started shaking it in the same rhythm and intention I experienced many times during dances near the kivas at Shungopavi village where they all live. He just walked into the living room and chanted oooo... as he shook the rattle and stomped his feet in the pattern of a deer dancer. This moved me deeply. The other woman, Delores was also a teacher at the school and a daughter of a medicine man. We would sit and eat our sandwiches outdoors together behind our trailers. I remember the first time I experienced the consciousness of the ants at our feet as we ate...She now lives next door to Virginia and just had cataract surgery. I know I am not the savior of the world. And, I know that I must do my part. It is my passion and my life to do my part. Laid hands on several of the Saufkie family and such energy came through. I had asked for a sign earlier if I am to return, then give me a sign. I felt the little boy, Virginia, and the energy coming through is a sign to return. Then, the whole format of the book came through during our drive home. Promised to return within a month and I am determined to do so. They need some things I can give them and I am planning a webpage for Hopi Friends with a list of items they need. They have done silver work and baskets, the traditional reed woven spiral ones. Griselda is of the turtle clan and Lawrence of the bear. On Hopi, the women own the land. They travel to various shows and teach at Idlywld in July each year. They had so few students last year, they didn't go this year. I plan to promote their teachings and go next July. I have returned from the mesas, full of peace and a deep resonance of the importance of our intentions and prayers. You are welcome to send me watermelon seeds, dried, not washed so I can bring them with me next time a visit in about a month. Cita and Griselda grind the seeds to oil the piki stone to make the delicious blue corn piki paper thin crispy bread. We will send you some for your contribution!. Also, bamboo and bird feathers are needed. Parrot feathers are appreciated by Lawrence for the ceremonial dress and teachings he offers to the youth of his village. I slid open the closet door to find the maroon vest and matching billowy pants with three buttons at each ankle. This was to be my genie or fortune teller outfit for the Halloween Party at our school, Second Mesa Day School. I was the school counselor at the K-8th grade Bureau of Indian Affairs School located near the intersections of I-87 and 264 across the road from Second Mesa, Arizona post office. This was truly the heart of Hopiland. All three Second Mesa villages, Shungopavi, Shipalovi, and Mishongovi, had children attending the school made of resconstructed brick and portable trailers. I found the outfit with ease and a white nylon knit shirt with long sleeves to wear underneath the vest. I put a long blue and red silk scarf over my head and wrapped it around and tied it behind my right ear. I carried with me a crystal ball that was made of smoky quartz and about six inches in diameter. It was my crystal ball. I brought my mini box of angel cards in case I blanked out about what to say to anyone. My yellow and white cinder block house was two houses and lesss than fifty steps away from the front door of the main school house. There were spider webs made of spun cotton on the corner of each side of the archway of the school hallway. Big styrofoam and black fluted paper spiders hanging down from their Halloween webs decorated the entrance to the school. I had recently been hired a month into school starting. This was the highest paying education position I ever had. I felt the fact that I had two masters degrees was acknowledged and compensated in this government position. Served as vice principal, truant officer and staff facilitator in addition to my role as the school child and family counselor. I smiled as I walked down the main hall. I got a student desk and chair to sit and set up my crystal ball and angel cards on another scarf I brought for the table cover. It was peaceful here and I was happy to be on Hopiland. Nearly six months pregnant with my first child, I wasn't really showing much yet. My breasts were very sensitive and the padded vest gave me more comfort. Every person I had eye contact with or smiled at came over for a reading. I thought I'd be asked questions about the future, but found myself easily tuning into each person telling them of a quality or ability I saw in them and how they could develop it or express it or how it was currently showing up in their lives. Each reading was intimate and magical with children and adults I encountered. A young Hopi man came over and sate across from me at my booth. His coal black pupils were so dialated, I couldn't see his iris. His jet black hair was pulled straight back over his crown into a pony tail. "Tell me something about myself," he stated. "You have the gift of creativity and sensitivity. Trust and listen to your inner voice more steadily. Best not to second guess your inner guidance." I asked if he remembered a time he didn't listen and was sorry he didn't. He nodded his head slowly and methodically up and down in a yes repsonse. Few people were left at school as I walked out into the night. It was a clear and starry evening. The sky was alive with constellations and falling stars. Planets and planes could be seen with my naked eye. The silence of the evening was full of cold, crisp air. Walking slowly, I cranked my head all the way back so I wouldn't miss any falling stars on my way home. I lived alone in this three bedroom house. As I entered the front door, the only light coming into the living room was the street light's reflection. I placed my crystal ball and purse on top of the book case in the living room. As I glanced to my right, I saw several kachinas dancing in ceremony down my hallway. I could hear the drumming and chanting with my inner ear. I blinked my eyes and their holographic light images were still seeable! They looked like deer dancers, like ghosts from the past, their presence was a blessing I sensed and I didn't understand why I could see them tonight. Perhaps they were welcoming me into this new community. That same night of Halloween, I had a significant dream. My baby's biological father was offering me teachings from a sacred tree with large fruits on it. In the dream, he was offering me what he had to give, which was his wisdom of experience. I awoke feeling good about our communication in the dream. Found out later in the week that one of the villages of Second Mesa Day School had their deer dance the weekend before. The deer dancers had fasted for ten days and chanted and prayed in the kiva every night before the dances at the villages. The kivas were like deep wells they descended into to chant, pray and smudge themselves in the fire pit in the middle of the kiva with a ledge for them to sit around the outer edge. The deer dancers wear heavy white skirts with red and green geometric designs like a stair step around the outer edges. Deer skin shoes, deer antlers for part of the headdress and fur around their ankles, necks and wrists. They were barefoot with tortoise shell rattles on their lower calves. They were in a trancelike state for the entire time. A fellow counselor from Polacca (first mesa village) was Hopi and a friend of mine. He told me of the rigorous preparation in becoming one with the deer before the dancing ever begins in the village. He said he fasted for three weeks and chanted and participated in the kiva prayers for the entire time as well. Another dream I had during the first six months of living at the foot of two of the three villages, Shipalovi and Mishongovi, was related to one of these villages. A wise woman who was keeper of the gourds, held one in each hand and played them like instruments and used them for communication. I felt her calling me to come to the village. In the dream, I was a young Hopi brave and I was terrified of the wise gourd woman. She held the secret to his dream, but he was too shy to show himself behind the stone wall.